A CIVIL rights activist has called on the Electoral Commission of Zambia (ECZ) to intensify sensitization education campaign on the referendum and overcome the vacuum of information among participants. And opposition political parties on the Copperbelt have expressed no interest in the referendum exercise, stating that it was ambiguous. Howerver, Alliance For Good Governance (AGG) president Joseph Chileshe said the current format of communication via short messages [SMS] that the ECZ was sending to subscribed phones was inadequate to explain the referendum. Mr Chileshe said interactive dialogue was what the commission needed to embrace as it would encourage people and spark the interest to participate in the referendum. He said the information was in the interest of the receiver and open discussions would enable the community engage in the exercise. ‘‘In the current state, communities have been left out because they cannot question SMSs,” Mr.Chileshe said. He said the commission needed to speedily engage competent bodies and stakeholders such as the Church mother bodies, civil rights groups and non-governmental organizations which have members countrywide if the excise was to attract many people. “We do not know when again Zambia will be accorded this opportunity. It is against this background that as a civil rights group, we have backed down from campaigns of wanting to push for the referendum to be separated from the tripartite elections. It is costly and we are not sure if the President after August 11 will be interested to amend the Constitution using the critical articles in the final draft,” he said. Mr Chileshe indicated that some foreign donors have approached the organization for sponsorship but the fear had been the conditions attached to the funds. 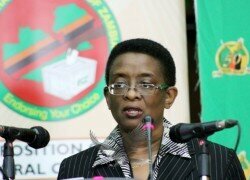 He said the civil rights group wanted to do what was in the interest of Zambians, hence the call extended to the ECZ. But the UPND on the Copperbelt have indicated that it was the responsibility of the State and ECZ and not the party to carry out the referendum campaigns. Information and publicity secretary Kennedy Kalunga said his party could not say anything positive about the exercise because UPND did not trust the PF to push for the agenda of amending the Constitution. Mr Kalunga said the party was however urging its members and the electorate to vote NO if they wanted to exercise their right. And Rainbow Party candidate for Ndola Central Robert Mwewa said his party was not wasting campaign time to engage the electorate about the referendum. “The exercise and what is being discussed is ambiguous; why should we discuss it if the communities being engaged do not even have the slightest idea about what a referendum is?” he said.